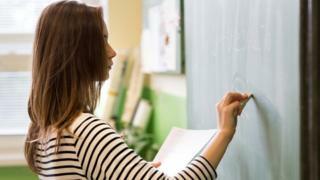 The NASUWT teachers' union said its members had received £14.9m over the past 12 months as a result of attacks, injuries and discrimination at work. The Department for Education said schools had a "duty" to protect staff. A DfE spokeswoman said: "No teacher should face discrimination or ill-treatment in the workplace. "The majority of schools provide safe and reasonable working environments for teaching staff, and it's important that they remain as such." Despite winning financial compensation for many of its members, the NASUWT said it believed the recorded cases of abuse were "only the tip of the iceberg". It added: "In most cases the money awarded does not compensate for the fact that a teacher's physical or mental health may have been affected and they can no longer work in their chosen profession."